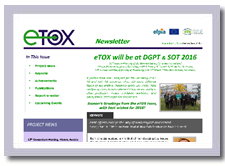 Issue Num 18 of the eTOX Newsletter has been launched in March. To download Issue Num 18 please click here. To download past Newsletters visit the Newsletter Archive. 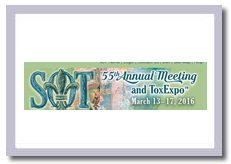 eTOX project is presenting 9 posters at the Society of Toxicology 55th Annual Meeting and ToxExpo, which is being held in March 13-16, 2016 in New Orleans, Louisiana. All eTOX posters can be visited here. A wide representation of eTOX members is attending the conference in which several results of the project are being presented in its 7th and final year. Issue Num 17 of the eTOX Newsletter has been launched in December. To download Issue Num 17 please click here. To download past Newsletters visit the Newsletter Archive. 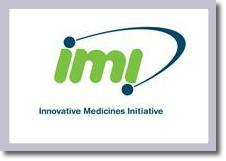 The Innovative Medicines Initiative (IMI) is a partnership between the European Union and the European pharmaceutical industry that is working to improve the drug development process and so accelerate the development of better, safer medicines for patients. IMI works by forging collaborative partnerships involving all stakeholders in medical research, including the pharmaceutical industry, universities, small and medium-sized enterprises (SMEs), patient groups, and regulatory agencies. Since its creation in 2008, it has established itself as a pioneer of open collaboration, and the impressive results of IMI�s projects amply demonstrate the success of the public-private partnership model. 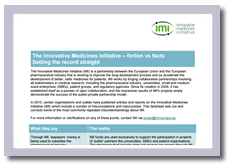 In 2015, certain organisations and outlets have published articles and reports on the Innovative Medicines Initiative (IMI) which include a number of misconceptions and inaccuracies. This factsheet sets out and corrects some of the most commonly-repeated misunderstandings about IMI. The complete article can be read here. 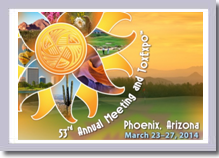 eTOX project has submitted 9 abstracts to the Society of Toxicology 55th Annual Meeting and ToxExpo, which will be held in March 13-16, 2016 in New Orleans, Louisiana. The Conference promises stimulating lectures and presentations on scientific breakthroughs, important education and professional training opportunities, and time to connect with old friends and create new collaborations. eTOX representation as a whole would entail a good opportunity to disseminate the results of the project in its 7th and final year of duration. Issue Num 16 of the eTOX Newsletter has been launched in June. To download Issue Num 16 please click here. To download past Newsletters visit the Newsletter Archive. The first eTOX Hackathon has been held from May 4th to May 7th, 2015, in Barcelona hosted by FIMIM. The eTOX Hackathon is a new initiative within the project designed as a hands-on exercise to promote collaborative best practice and team work across modelling and toxicology communities. Core of the exercise is the exploration of the collected eTOX data, consisting currently of more than 7000 studies on approx. 1200 different molecules. It is possibly the first time in the history of toxicology that such a cross-disciplinary group of peopletoxicologists, pathologists, modelers and bioinformaticians jointly analyze preclinical toxicity data at such depth and granularity. The event was organized around four challenges (In vivo hepatotoxicity modeling proof of concept, From potency to risk, Anemia model, Open Challenge) carefully chosen by a brilliant organization team. 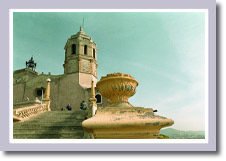 The results obtained from each challenge will be translated into usable results within the project. The commitment of all 30 attendees has contributed to make the Hackathon a successful event, meaning a huge leap forward in the common understanding of modelers, toxicologists, pathologists, and database experts. A second hackathon will most probably be held before the end of the year in order to continue the good results obtained. Issue Num 15 of the eTOX Newsletter has been launched in June. To download Issue Num 15 please click here. To download past Newsletters visit the Newsletter Archive. 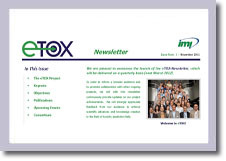 Issue Num 14 of the eTOX Newsletter has been launched in March. To download Issue Num 14 please click here. To download past Newsletters visit the Newsletter Archive. As part of Novartis� ongoing open source commitment (http://opensource.nibr.com), the company has recently published OntoBrowser as an open source software project. The source code has been released under the Apache License Version 2.0 and is available on GitHub (http://github.com/Novartis/ontobrowser). Consortium members are free to download and deploy the tool within their own environments. The release includes an installation guide to facilitate installation. As an open source project, consortium members are also free to modify the software to meet their own specific requirements. 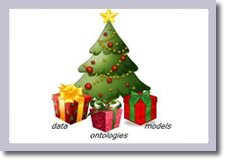 The OntoBrowser tool was developed to manage ontologies and controlled terminologies (e.g. CDISC SEND) used within the scope of the eTOX project. The primary objective of the tool is to provide an online collaborative solution for expert curators to map report terms (from the eTOX database) to preferred ontology (or controlled terminology) terms. 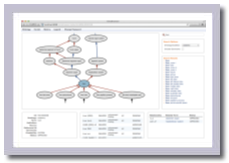 Additional features include: visualisation of ontologies in hierarchical/graph format, advanced search capabilities, peer review/approval workflow and web service access to data. Professor Michel Goldman, Executive Director of the Innovative Medicines Initiative (IMI), has been interviewed by National Centre for Replacement Refinement & Reduction of Animals in Research (NC3Rs), about eTOX. Prof. Goldman summarises his views about the eTOX project and hopes that regulatory agencies (as EMA) will include some output of the project in their own guidelines for the assessment of the safety of new drugs. For reading the complete interview please click here. 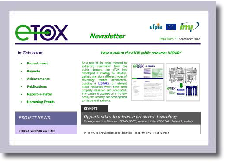 Issue Num 13 of the eTOX Newsletter has been launched in December. To download Issue Num 13 please click here. To download past Newsletters visit the Newsletter Archive. 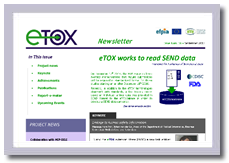 eTOX project has released a flyer for project dissemination. 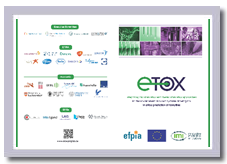 eTOX partners will distribute the flyer within the scientific community to raise awareness of the project. To download eTOX Flyer please click here. Issue Num 12 of the eTOX Newsletter has been launched in September. To download Issue Num 12 please click here. To download past Newsletters visit the Newsletter Archive. 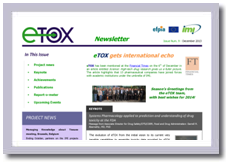 Issue Num 11 of the eTOX Newsletter has been launched in June. To download Issue Num 11 please click here. To download past Newsletters visit the Newsletter Archive. 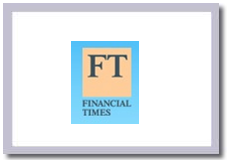 eTOX has been mentioned at the Financial Times on the 6th of December in an article entitled Science: High-tech drug research gives us a fuller picture. The article highlights that 13 pharmaceutical companies have joined forces with academic institutions under the umbrella of IMI. Issue Num 10 of the eTOX Newsletter has been launched in March. To download Issue Num 10 please click here. To download past Newsletters visit the Newsletter Archive. 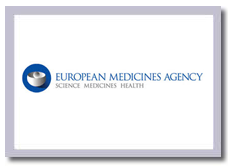 An update on the eTOX database and the prediction system was provided to the CHMP Safety Working Party (SWP) at EMA. The main focus was to develop a common understanding on the use of the system and expectation for validation of the systems. National representatives of the SWP expressed interest in accessing the database. In order to explore ways of cooperating between eTOX and regulatory authorities it was agreed to start a so-called Scientific Advice Procedure. 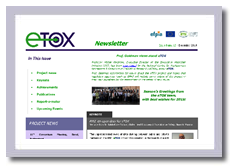 Issue Num 9 of the eTOX Newsletter has been launched in December. To download Issue Num 9 please click here. To download past Newsletters visit the Newsletter Archive. Issue Num 8 of the eTOX Newsletter has been launched in October. To download Issue Num 8 please click here. To download past Newsletters visit the Newsletter Archive. Version 1 of eTOXsys has been released to the eTOX community on the 14th of June. The eTOXsys version 1 application is based on the work reported at several deliverables and discussed at meetings. The release candidate of the version 1 application was introduced and demonstrated to the partners at the last Consortium Meeting held in Copenhagen in April 2013. This is a major step forward, offering the end user a much larger scope in terms of query definitions, number of available models and means to analyse, refine and interpret results. Issue Num 7 of the eTOX Newsletter has been launched in June. To download Issue Num 7 please click here. To visit past Newsletter visit the Newsletter Archive. Two articles acknowledging eTOX which were published in the January issue of Molecular Informatics Journal, The eTOX library of public resources for in silico toxicity prediction (Cases, M, Pastor, M, Sanz, F - FIMIM) and Exploiting Pharmacological Similarity to Identify Safety Concerns � Listen to What the Data Tells You (Muthas D, Boyer S - AZ), are among the ten most accessed articles in April 2013. 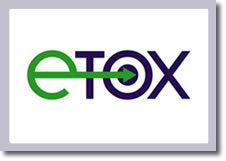 Issue Num 6 of the eTOX Newsletter has been launched in March. The eTOX extension has been highlighted as latest breaking news. To download Issue Num 6 please click here. To visit past Newsletter visit the Newsletter Archive. The review of the eTOX proposal was very positively evaluated. The accomplishments of the eTOX team were highlighted as commendable. Four new partners will join the consortium towards the overall objective of toxicology research of connecting in a heuristic manner experimental animal and biochemical studies to human outcomes. 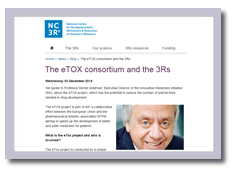 The eTOX ENSO proposes to build upon the early successes through expanding the acquisition of additional toxicology data inputs (species, types of trials, longer duration etc) and to access more public databases. Further realizing the potential and impact of including additional data dimensions and relationships in their analysis, the eTOX team proposes to link their project to new sources of related experimental data including different data types such as pharmacology. The reviewers also considered it impressive that the eTOX consortium has generated such a large number of high quality publication since 2011. 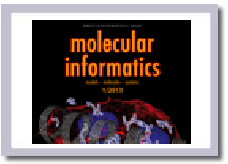 A special issue of Molecular Informatics journal on Advances in Computational Toxicology has been published in January with a special contribution from eTOX. 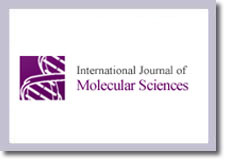 Molecular Informatics publishes research that will deepen our understanding about information storage and processing on the molecular level, signaling and regulation of biological and chemical systems including cellular systems and macromolecular assemblies, modeling of molecular interactions and networks, and the design of molecular modulators that exhibit desired biochemical and pharmacological effects. Two articles acknowledge eTOX: The eTOX library of public resources for in silico toxicity prediction (Cases, M, Pastor, M, Sanz, F - FIMIM) and Exploiting Pharmacological Similarity to Identify Safety Concerns � Listen to What the Data Tells You (Muthas D, Boyer S - AZ). T. Steger-Hartmann was invited to write the Guest Editorial. 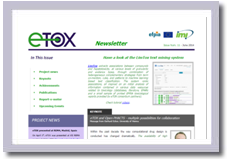 Issue Num 5 of the eTOX Newsletter has been launched in December. To download Issue Num 5 please click here. To visit past Newsletter visit the Newsletter Archive. 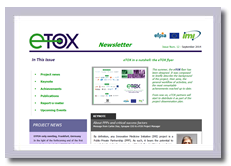 Issue Num 4 of the eTOX Newsletter has been launched in September. To download Issue Num 4 please click here. To visit past Newsletter visit the Newsletter Archive. An important activity of the ongoing eTOX project is to identify potentially relevant data on the toxicology field, evaluate the coverage of the available information on the different toxicity endpoints and its suitability for modeling purposes. The eTOX consortium systematically screens the literature and the World Wide Web looking for relevant data related to drug toxicity and has been collecting such information from the beginning of the project (April 2010). 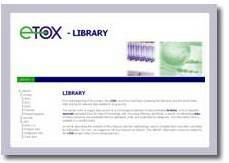 Since all this material can be of interest to other audience different to the eTOX consortium members, the full compilation of public resources, named eTOX-LIBRARY, has been recently opened to the public access through the eTOX website. eTOX has been presented at the Preclinical Assessors Meeting (FIMEA) held in Helsinki on the 10th of September 2012. Dr. Steger-Hartmann introduced eTOX project. This meeting is aimed at Predictive toxicology � modelling and simulation, in which industry and/or academia representatives present current initiatives. 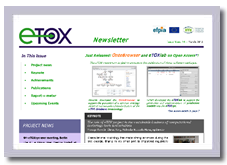 Issue Num 3 of the eTOX Newsletter has been launched in June. To download Issue Num 3 please click here. To visit past Newsletter visit the Newsletter Archive. The eTOX Mid-Term Review Meeting was held on the 15th of June in Brussels. The mid-term review represents the main evaluation and assessment point for all IMI projects. Intensive preparatory efforts were therefore undertaken by a dedicated eTOX team for this review � with rewarding results: The external reviewers evaluated the eTOX project as being well conducted and advancing at a good pace. The ontology approach was highlighted as impressive having the potential to become a standard also for other projects and the progress made in overcoming the legal obstacles for data sharing was emphasized. The valuable recommendations received will foster the work in the next months and will leverage the efforts of a well-united team towards achieving the aims of the project. 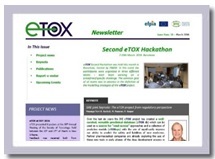 Issue Num 2 of the eTOX Newsletter has been launched in March. To download Issue Num 2 please click here. To visit past Newsletter visit the Newsletter Archive. 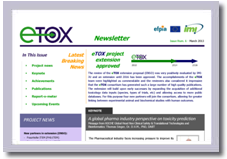 The concept and strategy of the eTOX project, together with current achievements and future deliverables is described in the article entitled 'Inroads to Predict in Vivo Toxicology—An Introduction to the eTOX Project'. The article has been published by the International Journal of Molecular Sciences, in its special issue Advances in Computational Toxicology. .
Briggs, K.; Cases, M.; Heard, D.J. ; Pastor, M.; Pognan, F.; Sanz, F.; Schwab, C.H. ; Steger-Hartmann, T.; Sutter, A.; Watson, D.K. ; Wichard, J.D. 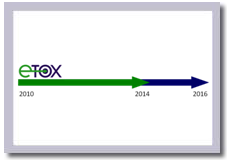 Inroads to Predict in Vivo Toxicology�An Introduction to the eTOX Project. Int. J. Mol. Sci. 2012, 13, 3820-3846. GRIB EXPO: Come and meet the future of biomedical informatics. The Research Programme on Biomedical Informatics GRIB (IMIM-UPF), a subunit of FIMIM leadered by Ferran Sanz, will organize a scientific exhibition on biomedical informatics this month. Both eTOX and Open PHACTS projects will be presented to a broad audience of academic, clinical and industrial organizations. 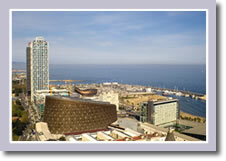 GRIP EXPO will be held on the 26th of April in Barcelona. Participants will have the chance to interact with scientist working on computational tools to shape the future of healthcare and drug discovery. More information here. The eTOX Project was presented at the European Parliament on the 6th of October as part of the Innovation in Action event. The session hightlighted the impressive achievements of IMI Projects. Professor Ferran Sanz, FIMIM, introduced eTOX through his speech "eTOX: Computational prediction of in vivo toxicities". The IMI conference formed part of a wider event, involving five Joint Technology Initiatives (JTIs) – IMI, FCH JU (fuel cells and hydrogen), Clean Sky (greener aviation), Artemis (embedded computing systems), and ENIAC JU (nanoelectronics). 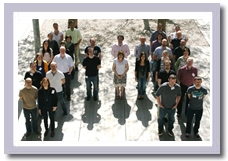 The eTOX 5th Consortium Meeting was held on the 7th and 8th of November in Sitges, Spain. A workshop on "Ontologies and Extracted Data Quality Control" were part of the event. The Scientific Advisory Board will be joining the Consortium Meeting for the first time. Members of the eTOX consortium will participate on the IMI Stakeholder Forum on Thursday 12 May in Budapest, Hungary as part of the World of Health IT (WoHIT) eHealth week. The event kicked off with a plenary session, jointly organised by IMI and the European Commission�s Information Society, on how knowledge and data management can trigger innovation in healthcare and drug development. Subsequent sessions featured presentations by leading scientists of the first achievements of ongoing IMI projects as well as an overview of IMI�s plans for the future and a glance at IMI�s forthcoming 4th Call for proposals. 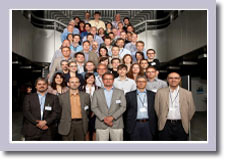 The eTOX 4th Consortium Meeting was held on the 23rd and 24th of May in Berlin, Germany. Two exciting workshops were part of the event: "Modelling for Toxicologists" and "Implementation of models as web-services".